it is fun to look back on what I thought I loved. Sort of like the Queen Anne dining room set that I just had to have when first married. Oh boy, did I love a whole set of furniture. Needless to say, that set is long gone -much to husband's dismay. Anyway.... for some reason, the older I get, the more I am drawn to modern interiors. Perhaps, it's because the modern aesthetic is so clean. It is without clutter, without busy, complicated materials. Lets face it, in a house with three kids, there just is a lot of clutter. No way around it. Not that I don't love 3rd grade self portraits or the obligatory kindergarden cut out snowflake, but sometimes (yes, I am admitting this) I feel like I am drowning in paper and school folder castaways. So, I think that a beach house, an escape house, should be serene, different and yes, whimsical. I realize that whimsical can be scary. Not lighthouse shower curtain whimsical, but fun (in a chic way.) I promise not to have seashells and seahorses in every single room- not one "life is better at the beach" sign. The trick will be to incorporate a modern look that is family friendly- and not so modern as to fight the look of the exterior. Below are some photos that inspire me....what do you think? 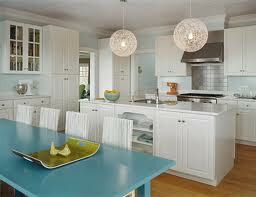 Above- fun kitchen photo- love the blue and green together. Above- from the portfolio of Molly Frey - she is a fantastic designer. 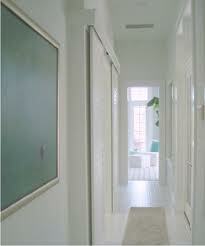 I think that is a fabulous Anne Packard painting in the hallway....I can dream, right? OK, so maybe not totally modern, but so clean and uncluttered. 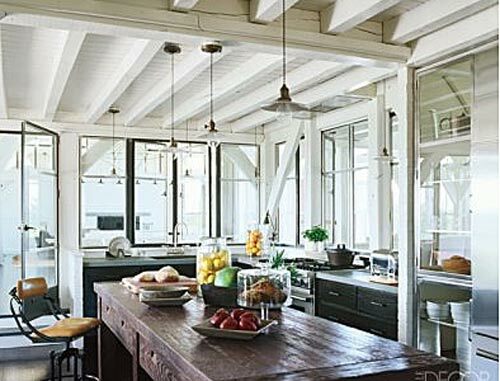 I love the contrast of the warm wood table with the slipcovered couches. 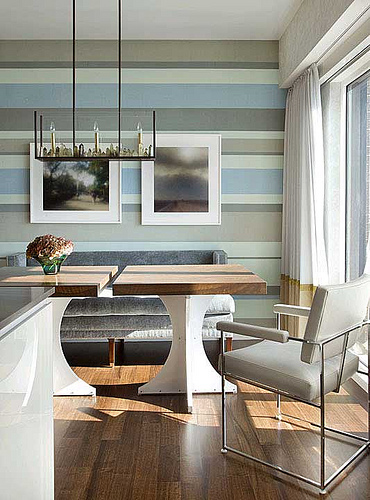 Above- A design by Frank Roop- he blends modern and colorful with perfection! I love the direction, not too modern please. I need comfy.